Yesterday was a fantastic event and proved us that it’s not always the athletes coming from +100kg winning the Open weight events. Toma Nikiforov, from -100kg, fought his way through to the finals winning every fight on his way by ippon. In the final he was defeated by the legend Teddy Rinner. The players Toma defeated were in average 20kg heavier than him, which proves that techniques and tactics can overcome power and weight. There was a clear difference in fighting styles and pace between the +100kg fighters and the -100kg fighters. Players of -100kg are moving and jumping a lot more than + 100 judokas and are able to make quick escapes in order to avoid falling on their back. The heavier fighters are a lot harder to throw and are obviously stronger but once they start falling they miss the agility to try landing on their stomach. According to an interview with Toma this is one of the reasons Teddy is exceptional. “Riner moves like a -100kg player.” Another obvious difference was that the heavier fighters slowed down much earlier during the fight comparing to the lighter athletes who could keep the pace through most of the fight and initiated much more strong attacks during. The weight difference between the heaviest and the lightest female competitor is 77kg. The heaviest competitor weighs 152.8kg more than double as much as the lightest contester of 75.8kg. While a clash could be fascinating it can only happen if both athletes fight for a medal (either gold or bronze). The -70kg player really brings this average down. The average of the +78kg players is 123kg. Only 3 out of the 14 +78kg players who compete in the world open weight championship weigh less than 100kg. 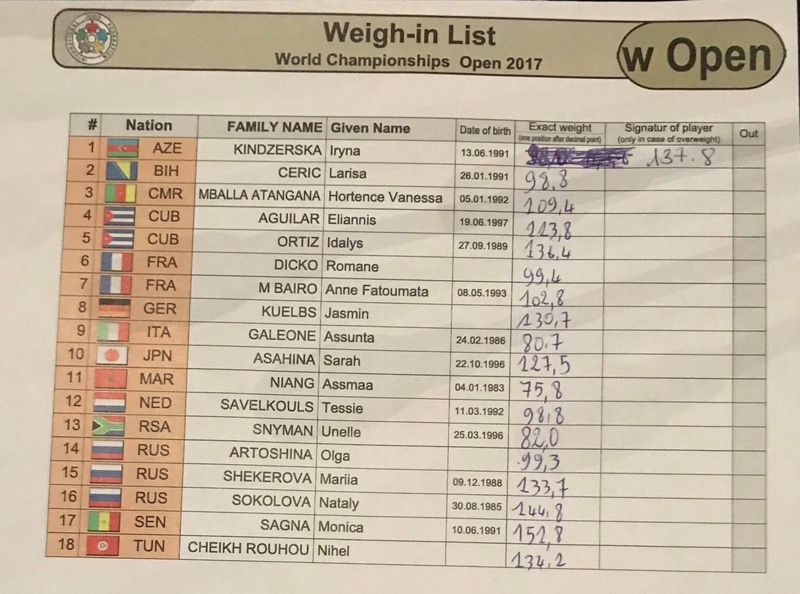 Interestingly, 2 of the 3 are leading the world ranking list right after Sarah Assahina; Larisa Ceric (2WRL) and Tessie Savelkous (3WRL do not reach 100kg and are much lighter than the rest. Are 2 athletes making a comeback? Yesterday we saw Iliadis coming back from retirement for this event and today we have 2 competitors coming back after an absence from the international stage since 2014. The last time Olga Artoshina fought was in 2014 in the Grand Slam of Samsun. Snyman Unelle was last seen in the African Championships in 2014. If we want to have more useful general correlations for top class fighters we need to know more about body composition. Minimum is body fat percentage, weight and height. If it is possible also skeletal muscle mass. With these data it would be clear why Teddy Riner is physically so superior. But you can presume it even without knowing data. I’m sure that you know about it. But it is difficult to get data. Even to get weighing data it was not easy, I suppose. I’m sure that BMI index for many athletes with high weight in open category was over 30. What means obesity. Is it good or bad? Advantage or weakness? It’s absolutely true what you’re saying, unfortunately I don’t have that information. It’s the first time ever I saw the actual weights of weigh-in published. There was another article I published around this putting the heights of the athletes competing in the Olympics in a graph [How tall are Olympic athletes?]. This data was taken from the questionnaire athletes filled in prior to going to the Olympics. Although the real accuracy can be questioned it’s nice to see those averages. BMI is a measurement that is outdated. Like you said a lot of athletes will have a BMI that is considered unhealthy. This is because they have so much muscles. Muscles as opposed to fat is not unhealthy of course. BMI has the advantage it’s easy to use (you only need height and weight), but it means very little.